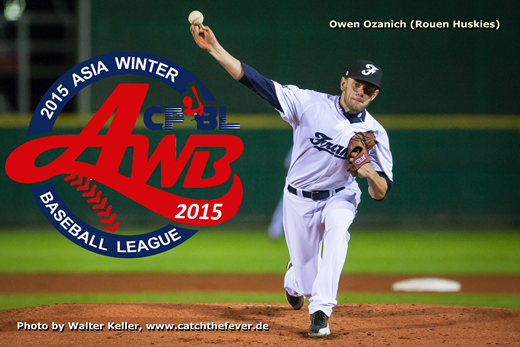 From November 28 to December 20 the Asia Winter Baseball League takes place in Taichung and Dou-Liou, Taiwan. Team Europe was invited for the first time to compete against squads from NPB, KBO and CPBL. 16 games are on the schedule for the European team. Games will be streamed through www.cpbltv.com. Owen Ozanich of the Rouen Huskies is also part of the team and will send us first-hand impressions for Mister-Baseball.com. CPBL and Europe played to a 4-4 tie on Friday in Taichung. The favored professional team from Taiwan got out to a 3-1 lead against French starter Owen Ozanich (5 IP, 3 R, 4 K, 2.51 ERA). Europe battled back to tie the game in the 9th and eventually take the lead, only to give it up in the bottom half of the inning. Leo Cespedes (1.1 IP, 0 R, 1 K, 6.00 ERA) and Twins prospect Matz Schutte (1.2 IP, 0 R, 1 K, 1.17 ERA) pitched well in relief of Ozanich before CPBL tied the game against Gianny Fracchiolla (1 IP, 1 R, 2 K, 11.25 ERA). Offensively Europe’s Chris Howard shined the brightest at the plate, going 2-for-3 with his second home run, pushing his average up to .400 for the tournament. Los Angeles Dodgers’ prospect Federico Giordani also had a good day at the plate, going 2-for-4, raising his average to .343. Europe will have a day off before playing Korea on Sunday, first pitch 5 AM CET.